In bright sunshine and shifty westerly winds, the round-robin stage of the Lysekil Women’s Match concluded Thursday afternoon. “Now we appreciate getting a little rest before the quarters” says Palludan, who, thanks to her top spot, can choose her quarter-final opponent. “After that we felt a little bit safer” says Bezel. “We lost too much distance to be able to do something” Palludan admits. “Well, I have to admit we’re a little bit surprised, but I know we can handle gennaker sailing. We’ve raced a lot in J/80s and in First 7.5s” she explains, looking forward to continue racing in the event. “It wasn’t a bad day for us, but we made some mistakes in the starts. Generally we had good boat handling, but sometimes we made it a little bit too hard for ourselves” she says. “Today we’ve learnt a lot. Because of the shifty conditions we had to change the trim all the time. Another important task was to look out over the course for pressure” Sylvan points out. “It is what it is. At least we get another six matches to learn more and get even better in these new boats. That’s not a disadvantage” she says. 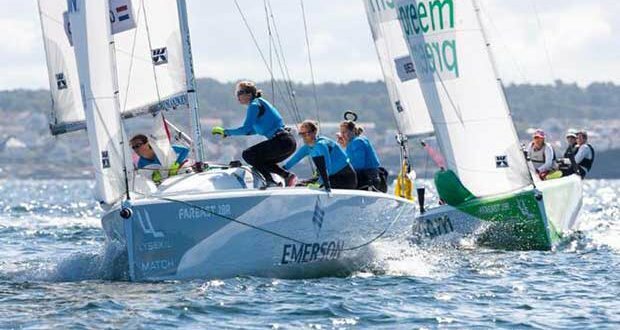 Event organizers Sailnet and Lysekils Yacht Club Gullmar will conclude the Repechage Round Robin stage of Lysekil Women’s Match, the second event on the 2017 WIM Series, Friday morning. Quarter-finals are to be raced Friday afternoon, with semis and final to follow Saturday.